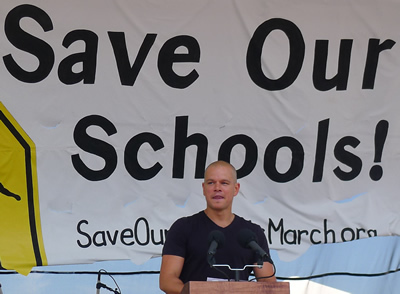 Matt Damon war for education, “Mission Accomplished Moment” sends his kids to private school. Claims he has no choice where he sends his kids to school while fighting school vouchers for parents. This entry was posted on August 8, 2013 at 7:12 am and is filed under Uncategorized. You can follow any responses to this entry through the RSS 2.0 feed. You can leave a response, or trackback from your own site.